In the planning of our visit to the UK we’d set aside ‘Thursday 15th September’ for taking a walk on Snowdon – without setting any expectations about how far we’d walk (since our group of four included my 6 year old daughter, Alice, and we had no idea what the weather Gods would have in store for us). The weather turned out to be stunning! 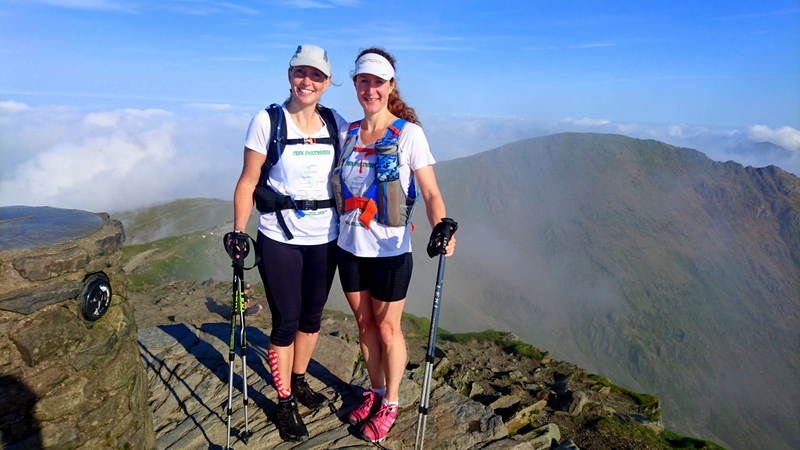 Our only plan was to meet up with my sister, Claire, and her friend, Pam, at the YHA Snowdon Pen-y-Pass at 8.30am. 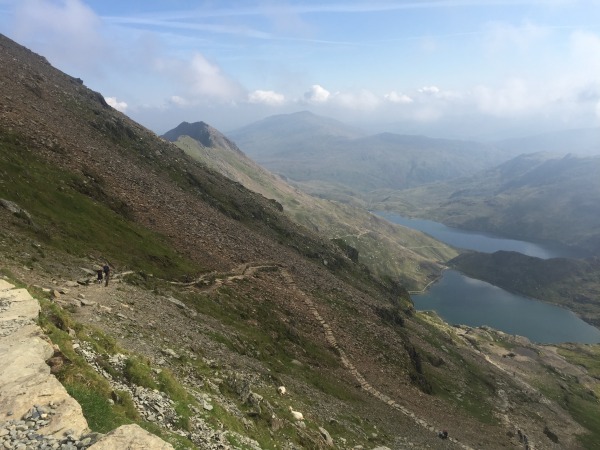 They were going to set out from there on a 26 mile route around Snowdon; on their halfway point of covering 15 marathon distances across the National Parks of the UK in the month of September (read more on their blog: Park Discoverers). 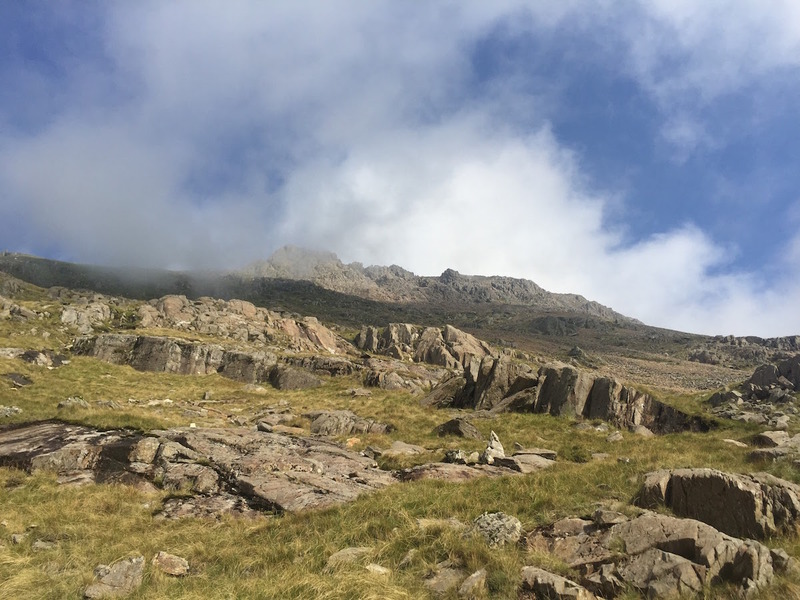 We arrived on time, but they weren’t anywhere to be seen – it turned out they’d checked out of the YHA and set off earlier, given the amazing weather the day had bestowed upon Mt. Snowdown, and left us a message… only mistakingly on my parents ‘home phone’ (rather than mobile), so we were clueless as to their whereabouts! We waited an hour before deciding to start off on the Pyg Track, at 9.30am. We later found out that Claire and Pam had reached the summit of Mt. 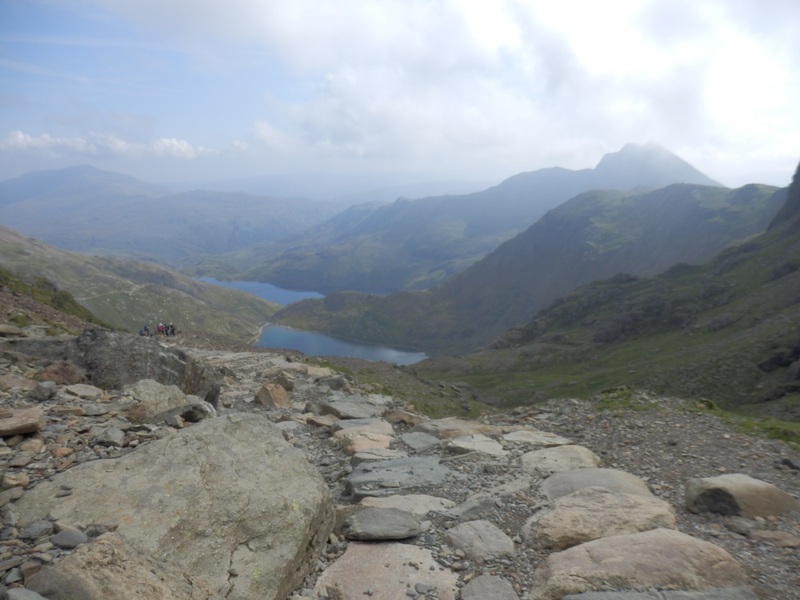 Snowdon at 9.30am, having started out on the Miner’s Track earlier. 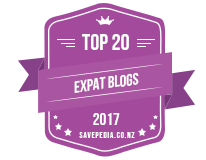 Their blog post ‘Snowdonia Round‘ is a great read. As we started our own climb, young Alice had no idea just how far she’d be walking up – neither did we! Alice was very keen to see her Aunty Claire, who’d she’d not seen in a couple of years, and was a little disappointed at not seeing her at the start of the walk. Thankfully we were glad to get cell phone reception within the first hour of our walk and on learning of the mis-communication we were happy to keep going, knowing we’d all be meeting up for dinner later that day. The first half of the Pgy Track walk was tough going in places, especially for young Alice and Grandma. Thankfully Grandad is a superb guide and kept us all moving and motivated! Grandad helping Grandma to navigate some tricky rocks on the first part of the climb up the Pgy Track. Alice making her way into the mist. The morning cloud and mist started to clear as we continued our ascent, rewarding our efforts with beautiful views. 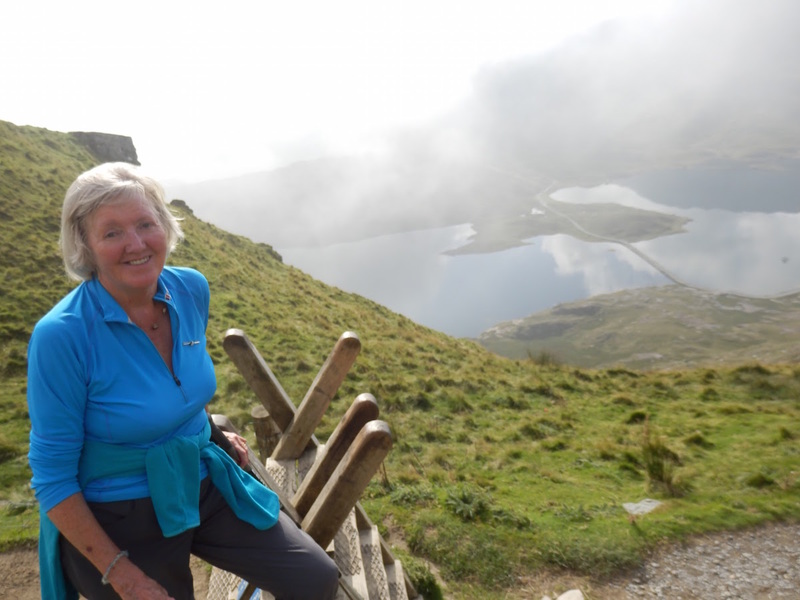 My dear Mum, Alice’s Grandma, Celia Aspinall, taking a breather and enjoying the stunning scenery. 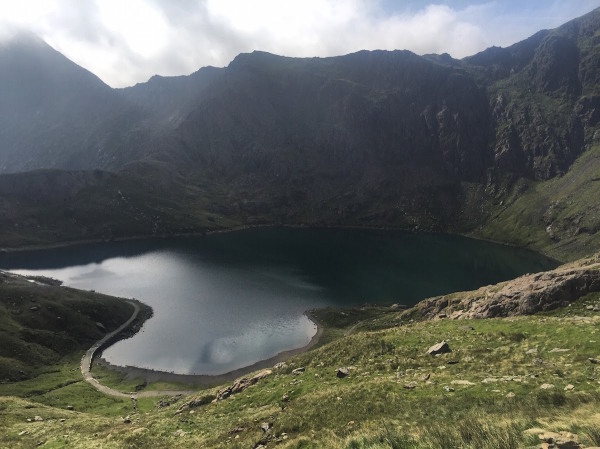 At this turning point, following the Pgy Track along the hillside below Crib Goch and above Llyn Llydaw, Alice started to pick up the pace – having caught sight of the summit of Snowdon. 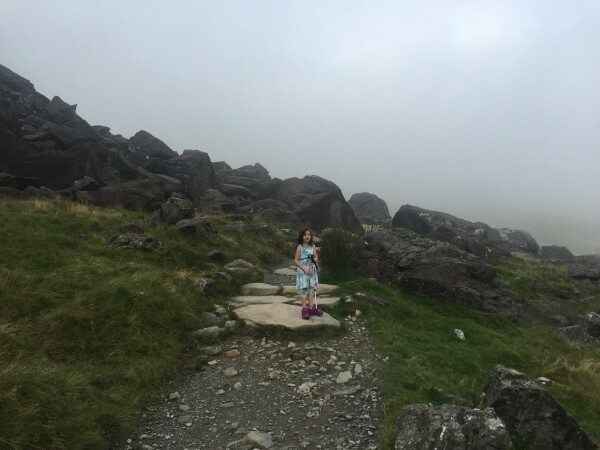 We still had a lot of climbing to do, but we’d gone beyond half way and Alice was determined to get to the top. The summit in the misty cloud, playing peek-a-boo. 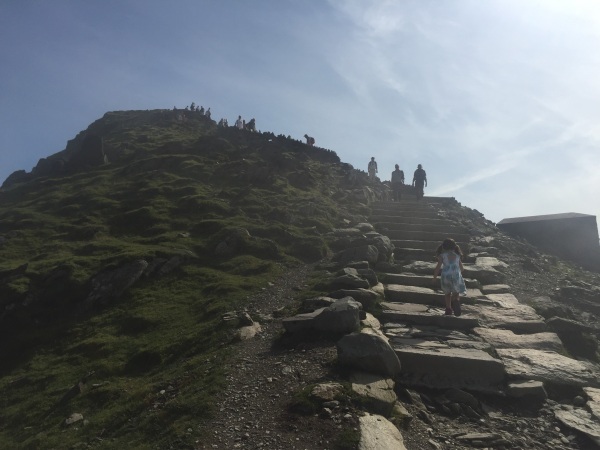 Alice kept moving ahead, running in places and then stopping to catch her breath, until we’d got so far ahead of Grandma and Grandad that I messaged them to say we would reunite at the summit. 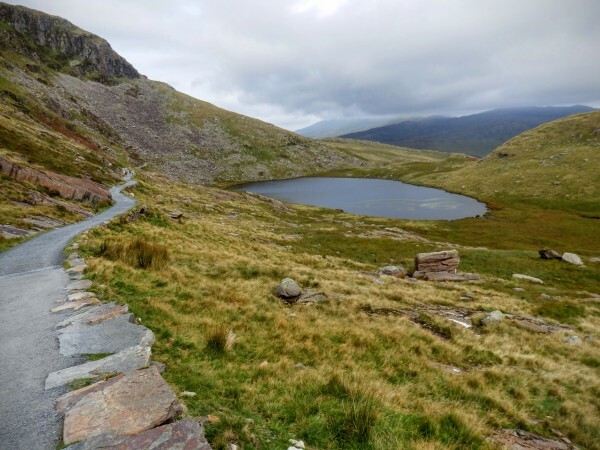 I had plenty of water in my pack – but not much food (Grandad had the best of those supplies and I hadn’t thought to better distribute them at the start of the walk – never believing Alice would forge on so far ahead!). I was a little worried that Alice would run out of steam without food, but the thought of a cafe being at the summit kept her going. 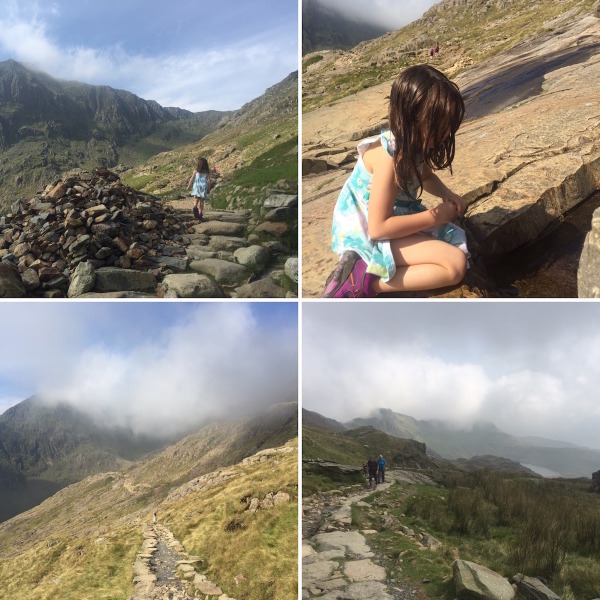 Every time she stopped I’d give her the option to wait for Grandma and Grandad (who had the food supplies) or to keep going. The time she rested at each stop became increasingly longer, but she always ended up making the decision to push on. Alice enjoyed stopping to cool off whenever a trickle of water passed our path. Alice cooling her feet down! In places the rock was quite polished and I can imagine it would be quite slippy when wet. Once the Miner’s Track joined the Pyg Track the going became rockier, with the pathway leading in different directions. We kept looking out for cairns to help guide the way, especially when there wasn’t a hiker in front to follow. 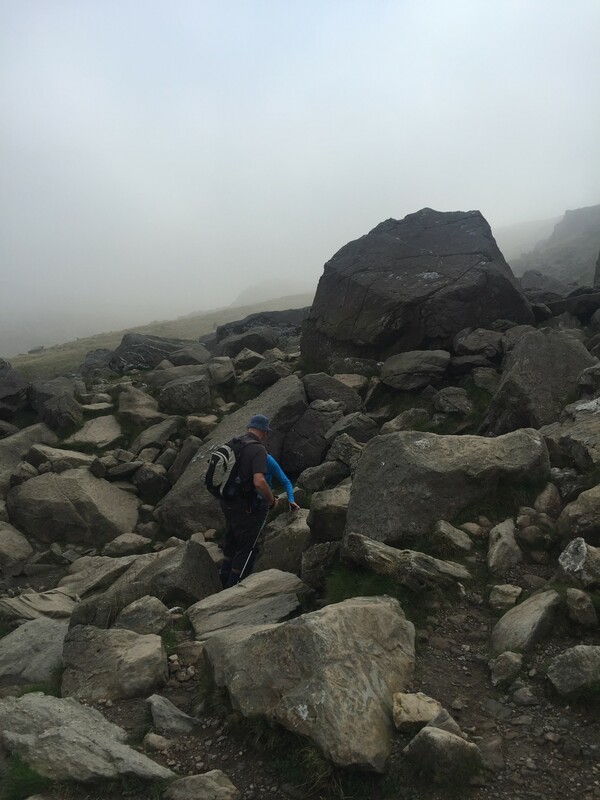 We generally stuck to the right, but at times wandered a little to the left, finding ourselves on scree. It would be very easy to stray off the path at some points here, especially in poor visibility. We’d meet people coming down from the summit who would marvel at young Alice’s determined strides. She would reply, ‘I’m strong, I can do it, and I’m only 6 and a half’!’. We joked with Alice that the extra ‘half’ was the key to her amazing stamina. It was only after we’d reached the crest of the ridge marked by a finger post, Bwlch Glas, that Alice’s hunger started to really dampen her energy levels. 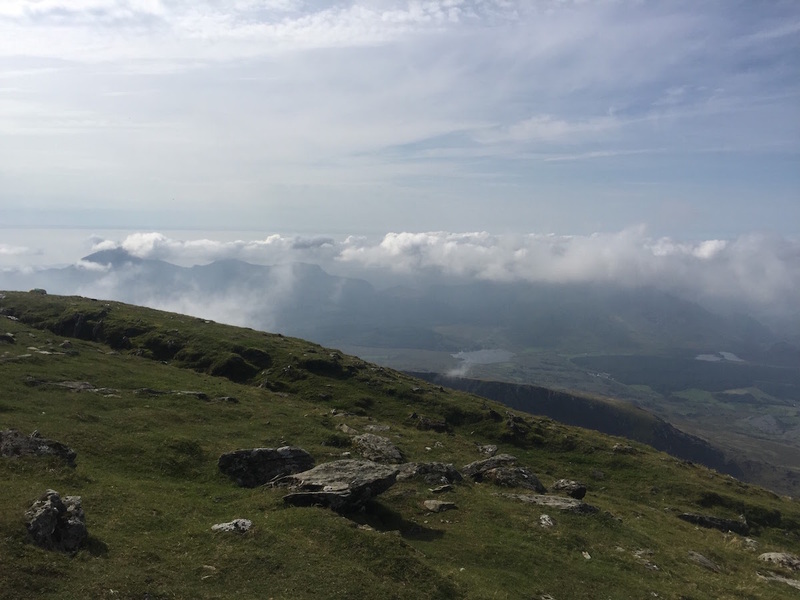 She actually lay down on a rock at one point and said, ‘I’m so tired that I could have a nap here.’ I sat next to her, encouraging her to rest, but after a short while she said, with a slight tremble to her voice, let’s keep going to the summit and the cafe Mummy. 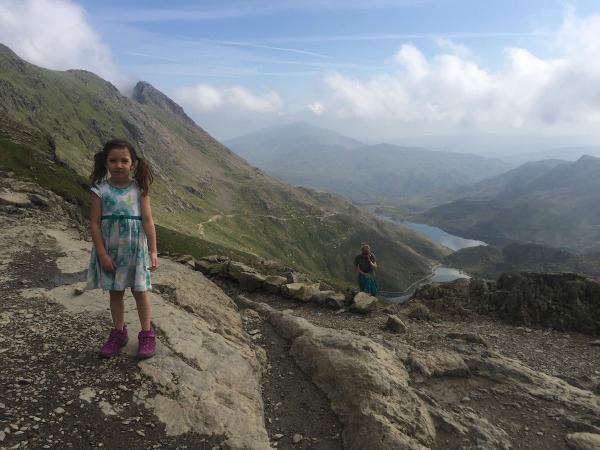 Alice getting closer to the summit of Mt Snowdon. The summit really was close now, especially after all the climbing Alice had already achieved, but it was still another 100m climb. It was at this point, with tears threatening to overcome Alice, that I offered up a ‘piggy back’. I strapped my rucksack to my front, to make space for Alice to climb up on my back, and made every step count. She could hear my breathing become more laboured and volunteered to walk again, after only 20 metres or so. I was so, so proud of her (and very relieved!). She was also so proud of herself at having done something that neither of her older sisters have done! Alice finally reaching the summit! The views all around the summit were amazing. 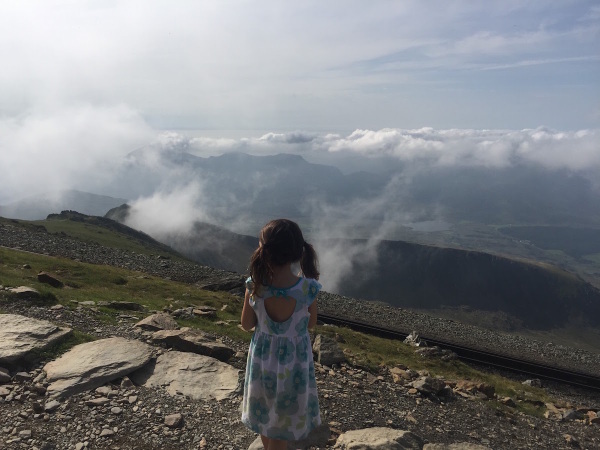 Enjoying the views from near the summit of Snowdon. I wanted to linger and take them in for an age, but Alice’s hunger was at the forefront of her mind – so we headed straight to the cafe. Before we even reached the cafe there was a vending machine full of chocolate bars… which there was no way we were going to walk past without getting something – so a 4 strip Kit-Kat it was! The cafe had a large windowed wall, perfect for admiring the view whilst relaxing over a much needed bite to eat and a drink. We were only there for about twenty minutes before Grandma and Grandad joined us. 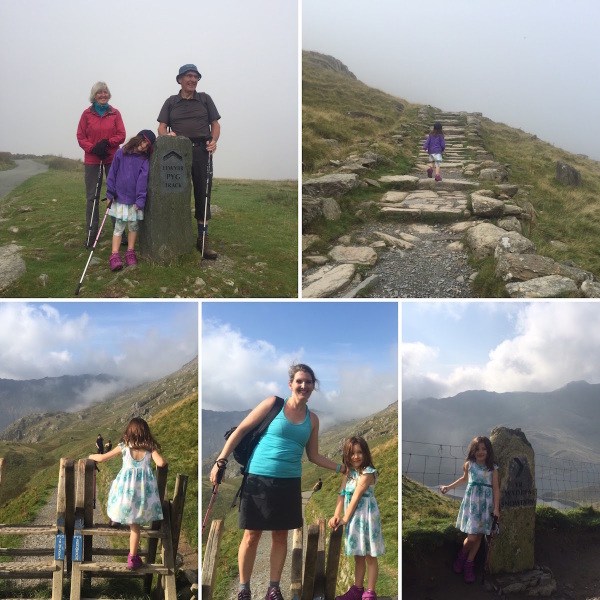 I was so proud of my dear Mum (and my amazing Dad, who is an ace guide and motivator!). I found a pin badge in the shop that celebrated reaching the summit and awarded one to Alice and one to my Mum! Now came the big question… ‘How were we going to get back down?’! “Can I get a single ticket down? 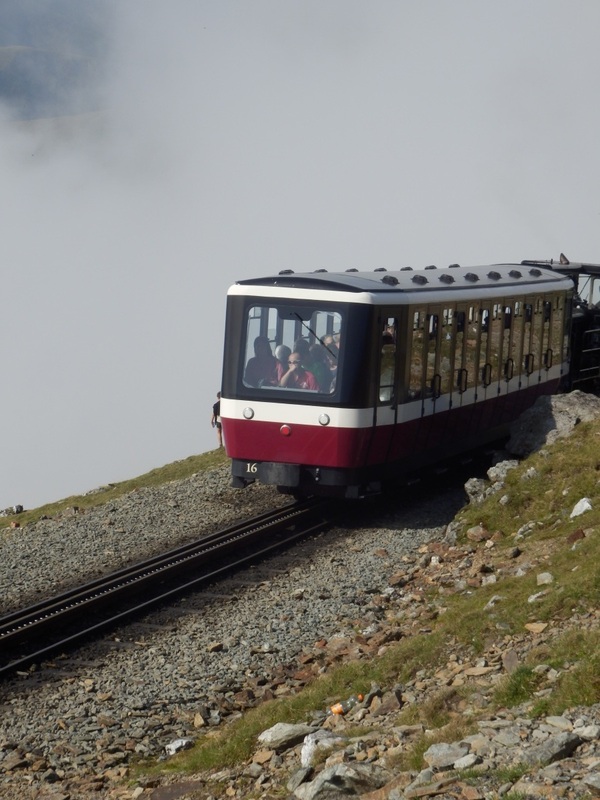 Given that the day we’d walked up to the summit turned out to be an absolute stunner, the trains were all VERY busy, so much so that when we asked if there were any seats available we were told that there was only ONE left all day, and it was on the train that was leaving in 5 minutes! Now I was fine to walk down, as was my Dad, but I knew Alice was exhausted (having woken up early and not had a great sleep the night before) and I was worried about my Mum on the descent. Whoever did get the train down to Llanberis would also have to wait for the others to walk down, pick up the car from Pen-y-Pas, and drive around to Llanberis. A kind member of the railway staff went to ask the driver if Alice could ride down on my lap, so as to take up only one seat, and he kindly agreed. I would have gladly given the seat to my Mum, but it would have been too much for her to have Alice on her lap all the way down and then look after her for a few hours, not knowing when Dad and I would be there to pick them up. My Mum said she was happy to walk down with Dad, via the Miner’s Track and so we bid them a hasty farewell and wished them all the very best. 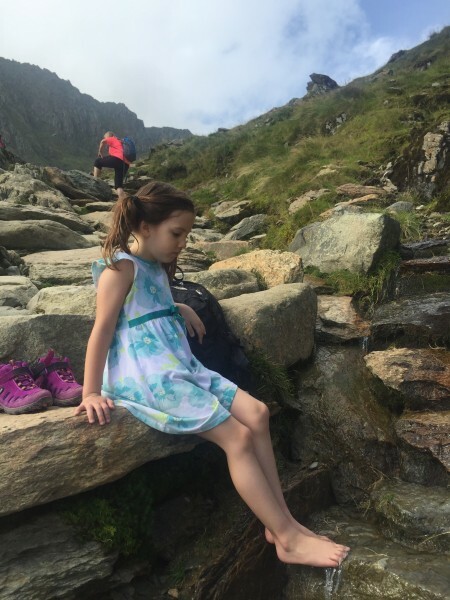 Alice fell asleep within five minutes of boarding the mountain railway train – and stayed that way until I carried her off at Llanberis! We then spent a few hours looking around the visitor centre before taking a stroll into the sweet town of Llanberis, where we’d arranged to meet up with Claire, Pam, Mum and Dad, for dinner at ‘Pete’s Eats‘. Meanwhile, Mum and Dad began the slow descent to Pen-y-Pass, from the summit of Snowdon, taking the Miner’s Track (can you spot the eyes in the mountain tarn, making the image of a face?!). They had a great walk down, with the weather staying kind to them, and made it to Pete’s Eats for dinner by 6pm looking remarkably sprightly! 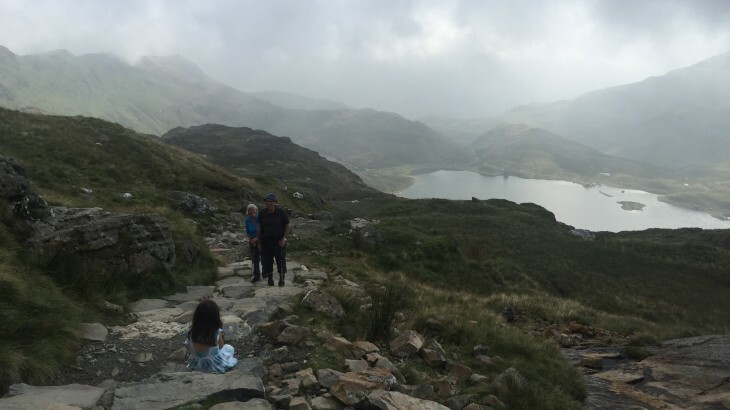 I was extremely proud of my folks, at the age of 69, to accomplish such a big day of walking, over difficult terrain, and with a huge ascent and descent to boot! Snowdon (Welsh: Yr Wyddfa, pronounced [ər ˈwɪðva]) is the highest mountain in Wales, at an elevation of 1,085 metres (3,560 ft) above sea level, and the highest point in the British Isles outside the Scottish Highlands. 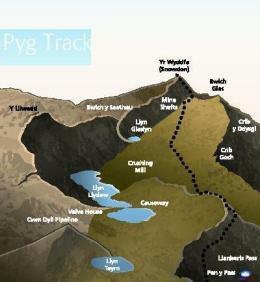 It is located in Snowdonia National Park (Parc Cenedlaethol Eryri) in Gwynedd. 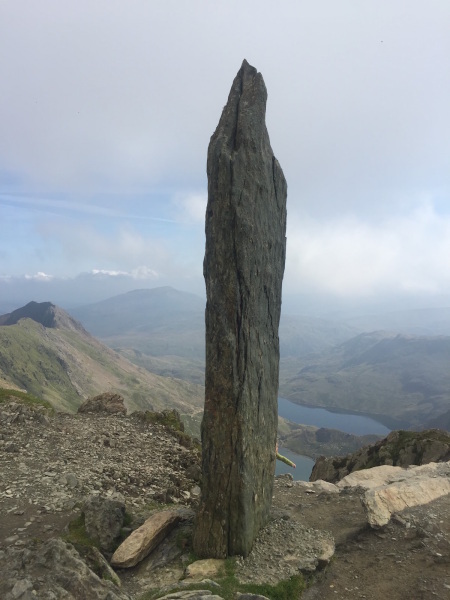 The rocks that form Snowdon were produced by volcanoes in the Ordovician period, and the massif has been extensively sculpted by glaciation, forming the pyramidal peak of Snowdon and the arêtes of Crib Goch and Y Lliwedd. 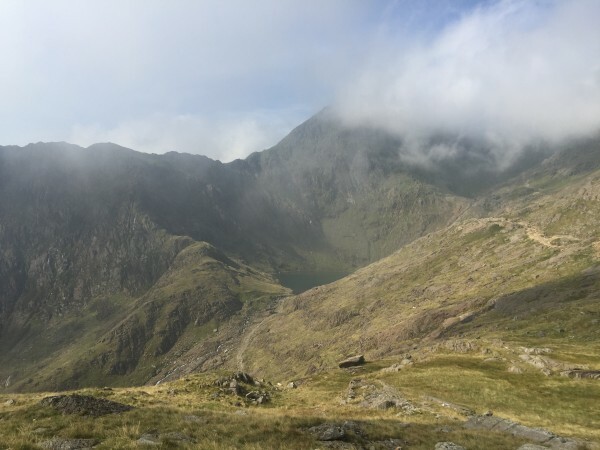 The cliff faces on Snowdon, including Clogwyn Du’r Arddu, are significant for rock climbing, and the mountain was used by Edmund Hillary in training for the 1953 ascent of Mount Everest. Alice, Country Kids, Header, Holidays, Learning & growing, Sarah, Walks Country Kids, national park, Snowdon, trails, UK2016trip, walking. permalink.